The boy races to the top of the structure, and standing under the castle turret he looks down at his playmates below. Then AJ* climbs a bit higher for good positioning, drops his pants, and proudly sends a stream of urine to the sands below. I think about AJ as we carry the tree into the house, and set to trimming the lower branches. AJ had learned how to pee from high places while camping with his father over a long weekend. He had been so proud of his new skill. Tammy* sits huddled on a small chair in the corner of the kitchen; she takes out a pen-like object, sets it against her finger and clicks it. As the blood pools on her finger she touches it to the edge of the litmus paper. She places the blood soaked paper in a white machine, presses a button, and waits for the verdict . . . today no juice, no cookies. I pray for Tammy as we lift the tree into the stand and carefully check it from all sides to make sure it is straight. We tighten the screws. At age six, Tammy had learned to manage her diabetes. I pray that she is still healthy and that Christmas brings her joy. The tree leans imperfectly to the left. We leave it be. Trevor* calls my name, anticipation oozing from his face as I walk over to where he is. Cupping his hands gently he stands up and extends his arms. I lean a bit closer as his thumbs separate to share his treasure. A wolf spider crawls toward the light, and I recoil. Recovering, I lean a bit closer. The lights are untangled, and all are working. I think of Trevor as we nestle the lights deep in the branches; first one set of two hundred, then a second set. Months prior to finding his pet spider, Trevor’s hyperactivity had torn his family apart. But on that day he was a scientist, cheerfully exploring the world around him. We plug the lights in and three-quarters of the bulbs radiate a rainbow of colors. Good enough. We hang the ornaments: the angel reminds me of Janet; the gingerbread snowman is John. Some of the ornaments sparkle, others are chipped, but all find a place on the tree. Brooke, age 13, chatters at her Mom as they drive south on the Maine Turnpike. Her mother slows at the toll booth and Brooke helps her find some change in the center console. Her mother stops and unrolls her window. The pickup behind them never slows; never stops; until it has their car crushed beneath its weight. Brooke’s two-year old brother sits in his car seat alone in the back and alone for the future. And Russell was killed in Afghanistan by small arms fire in 2006. He and his twin brother are still eight years old to me. He was too young to die. I lift an ordinary white sheet from its box and, corners in hand I shake it toward the ceiling and watch as it floats down, down, to rest on the carpet. Pastel pinks, greens and yellows are peppered among the pristine white. The sheet was a going away gift from the children at the school where I had worked. The children had watched eagerly when I opened the box and lifted out the sheet. They had huddled closer to hear me praise their work. I run my hand over the soft colors, there’s AJ’s name, and Tammy’s. Trevor’s name is in brown alongside a drawing of a spider. I see the many names of children that had been in my care. I find Katie*, whose family stood by her side as her seven-year old body fought cancer. 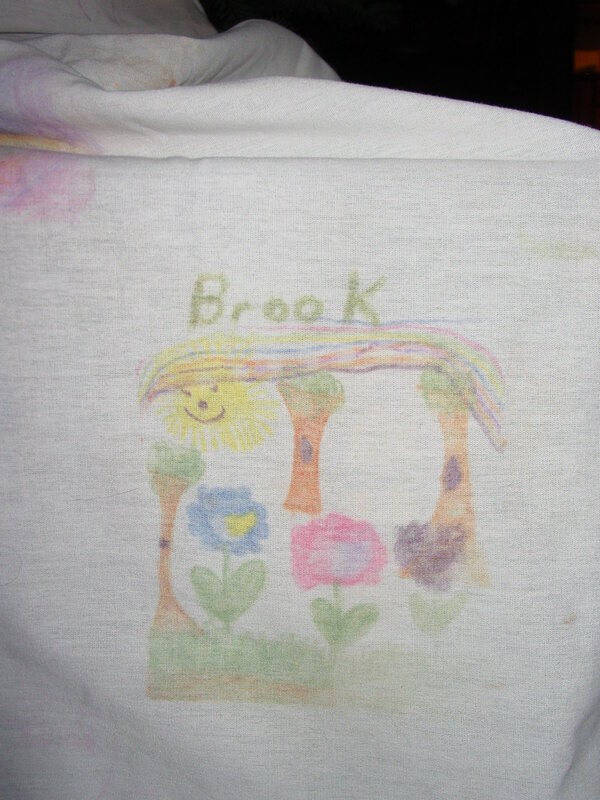 And I find Brooke, a garden blossoming under her name. Every year I search for Russell and his brother among the crayon colors, disappointed that their names have faded. I reverently lift the sheet and swaddle it around the base of the Christmas tree. I remember the children who no longer remember me. And I feel loved. This entry was posted in Nostalgia and tagged Children, Inspiration, Memories. Bookmark the permalink.